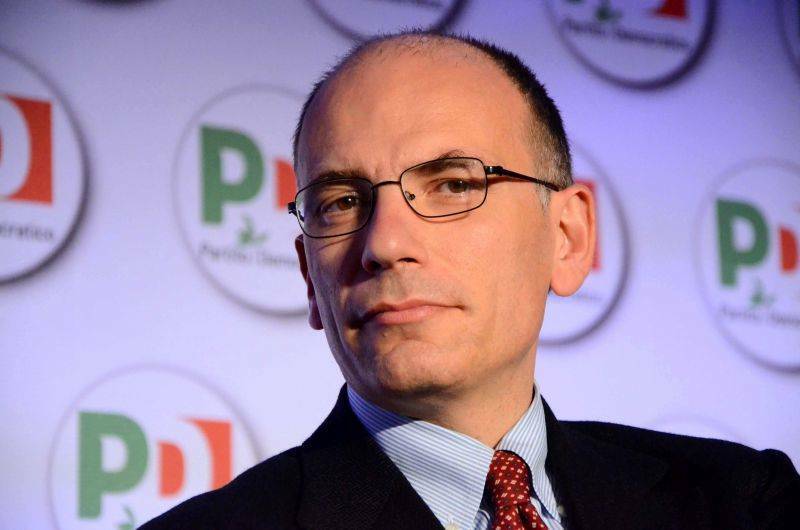 In his attempt to weld together governing partners so as to end over two months of dangerous political void, Premier Designate Enrico Letta, 46, of the Partito Democratico (PD) has called for a "slim and sober" cabinet that will hit the ground running. Letta was called upon to try to form a government only l7 hours after Napolitano's re-election to succeed himself as president. His program points for a "service government" reflect some of the advice put forward by the so-called "sages" appointed last month by President Giorgio Napolitano. If he succeeds, a new government is expected within the week. ROME - In his attempt to weld together governing partners so as to end over two months of dangerous political void, Premier Designate Enrico Letta, 46, of the Partito Democratico (PD) has called for a "slim and sober" cabinet that will hit the ground running and will be a "government of service." As he negotiates with a trio of parties who have finally agreed to work together for the good of the nation - Letta's own fractious PD, of which he is deputy secretary; the Freedom Party (PdL) of former Premier Silvio Berlusconi; and the smaller neo-party of acting Premier Mario Monti - the program points under discussion reflect some of the advice put forward by the so-called "sages" appointed last month by President Giorgio Napolitano. "Our objective is to moralize public life and give it new impetus," Letta declared. His program calls for reducing the number of MPs and senators, rewriting the present detested electoral law, revising the law on public funding for political parties, and possibly eliminating the costly overlay of provincial administrations. Needless to say, also on the carpet is reconsideration of the tax laws, from the hated tax on first homes (IMU) to the VAT tax, which is set to rise automatically by 1% on July 1, with the risk of further cooling consumer demand. But until there is a cabinet the moment the program points are the least of it. The heated negotiations this weekend are over names of the 18 or so cabinet ministers, at this writing still the subject of speculation and only that. For the PdL its secretary, Angelino Alfano, is handling negotiations with Letta until Berlusconi returns from Texas, where he attended the opening of the George W. Bush presidential library (and where Berlusconi told Fox News that he had done in six leftist premiers). On Friday Letta returned to the Quirinal Palace for another session with Napolitano, who continues valiantly in the role of the nation's good shepherd, but no new government is expected until early next week. It is clear already, however, that a Letta-led cabinet will have a fair political backing and will not be, as Monti's was, a government of technicians. "We will not back a summer season government (governo balneare)," Alfano declared. At the same time, Berlusconi has warned that, if this government - which he promises to support - fails to take actions he considers appropriate, after what he deems a decent interval (nine months or so) his party will withdraw its support. As if anticipating such a threat, Letta said firmly, in accepting President's appointment, "We cannot permit ourselves to have new elections. The outcome would be the same at any rate: blocs." By this Letta was referring to the paralyzing three-way tie among the PD, the PdL and Beppe Grillo's Five Star Movement. Not incidentally at this time of financial crisis, a new round of national general elections would cost the country, as did those of February, over $500 million. The key cabinet posts are economy, justice (whose choice inevitably affects Berlusconi), the interior and the foreign ministry. Berlusconi has been accused of blackballing the candidacy of Anna Maria Cancellieri to succeed herself, supposedly because she axed 33 local city governments on grounds that they were Mafia-ridden. By way of response, in a faux compliment, Berlusconi said that his party appreciates her and indeed has offered her a post in (notoriously leftist) Bologna. Alfano himself is considered a possible deputy premier. Among the missing in the cabinet will almost certainly be Matteo Renzi, the popular Florentine mayor and probably the most popular single individual in the PD, with perhaps 35% of the party behind him. Italian news reports have Berlusconi casting Renzi aside as "too young, too untested and, above all, too popular." But it is just as likely, since Berlusconi and Renzi just had a long and friendly private meeting, that Renzi is standing aside in his own long-term interest. The newest public opinion polls show that the PD, with its former head Pier Luigi Bersani confirming his resignation, is split between two factions: those who sympathize with the Grillo's M5S and those, headed by Renzi, who are not unwilling to negotiate with the Berlusconi-Monti area in the national interest. As for Grillo himself, he refuses to participate in any forthcoming government, and continues to call Napolitano's re-election a coup d'etat and to make acid personal comments about Napolitano himself. Nevertheless, a delegation of "Grillini" did participate in preliminary talks with Napolitano earlier this week and spoke cordially about the meeting afterward. And then Grillo went on to offend many - including Napolitano - by refusing to honor the solemn commemoration April 25 of Italian liberation from Nazi-Fascism. "Will the parties understand that they have an opportunity and no alternative?" asked Beppe Severgnini, in Corriere della Sera Friday. "The recent past suggests caution," he answers his own question. They have shown "grotesque" lack of appreciation of Monti's efforts when he was called in to head an emergency government "like a medic in a casualty ward" in November 2011. "Europe doesn't want a rerun of a vampire film." Speaking of vampires, Il Venerdi (the weekly magazine published by La Repubblica) points out that in l992 Giuliano Amato, former premier and only last week still a candidate for the presidency, had the state collect .006 in funds from private citizens' bank accounts, albeit not on the level of Cyprus. Amato is among those now under consideration for a cabinet post.